Anyone who has interacted with Sadia Dehlvi will agree that she is a ‘giver’ in the truest sense. The love with which she serves her food, the openness with which she shares her family recipes and the fluidity with which she narrates stories about her family, the evolution of cuisine in Delhi, and so on, almost envelopes you in her positive aura. Having authored two books on Sufism, entitled ‘Sufism – The Heart of Islam’ and ‘The Sufi Courtyard’, Sadia is a sufi soul herself! Since I missed the highly talked about COMMEAT’s Iftar-e-Dastarkhwan that Sadia hosted in her home during the holy month of Ramzaan, I was doubly excited upon being invited to a pop-up of Dehlnavi cuisine at Sheraton, New Delhi’s Delhi Pavilion. 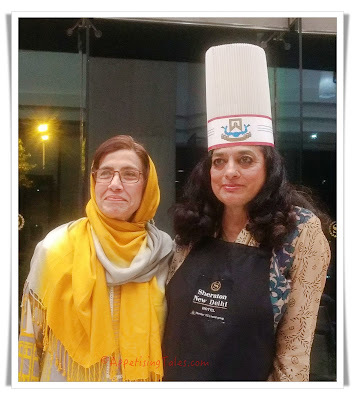 An avid cook, Sadia was particularly happy to cook with the masterchefs of the Sheraton due to her family’s association with ITC Hotels since they lived down the road from ITC Maurya for many, many years. Sadia Dehlvi (R) with her sister-in-law Asyie Dehlvi. Since the evening was focused on Forgotten Treasures – Culinary Trails of Shahjahanabad, Sadia shared umpteen stories about how the cuisine evolved in the capital through different eras in the walled city. While the Tughlaks brought minced meat cooked with nuts, the banias added the vegetarian fare and chaats. The Punjabis, especially after the Partition, brought the tandoor, creamy dals and paranthas. Each dish thus served comprised of flavours that form an intrinsic part of Delhi’s culinary heritage, and those that are cooked regularly for friends and family in the Dehlvi home. Needless to say, many of these dishes are not found on restaurant menus anywhere, such as the kachri keema that is tenderized with pineapple pulp and half-ripe papaya and smoked while cooking. While this turned out to be the star dish of the evening, there were other gems that are equally lesser known yet finger-licking good! Shabdeg is a delicious carrot and kofta curry. “It can also be made with turnip, but we prefer carrots,” shares Sadia. 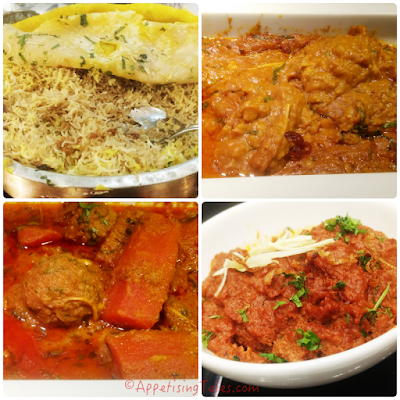 Then there were the usual suspects – a succulent yakhni pulao, perfectly spiced haleem and a hearty aloo gosht. Sadia's latest book, 'Jasmine & Jinns' is a treasure trove of all these recipes and many, many more, interwoven with tales of Delhi's ancient past and her personal memoirs. She graciously allowed me to share her recipes with you. I have chosen the delicious, smokey Kachri Keema since it is "a specialty and not many outside our community know about this dish," she shares in the book. It is also ideal for Delhi winters. Enjoy! Marinate the mince meat with all the above ingredients. Leave overnight in the fridge or at least for four to five hours. Mix the curd and onions with the marinated mince meat and hour before cooking. Heat oil and add the cloves and cardamoms and leave for a minute or two till they crackle. Now add the marinated mince meat. Stir for a few minutes on medium flame and then leave on low flame till done. Do not use the pressure cooker. This is a dry dish, so let the water released from the mince meat evaporate fully. After the mince meat is cooked, prepare to smoke it. Light a small piece of coal over the stove flame, then place it on an onion slice, pour a few drops of oil on the live coal so it smokes. Then, leave the smoking coal over the keema and cover the cooking pot with a lid. Let it remain there for a few minutes. Garnish with fresh chopped coriander leaves, onion rings, chopped green chillies, shredded ginger juliennes and a sprinkling of garam masala. A squeeze of lemon juice adds a bit of tanginess.